BEXEL Manager is an integrated suite of BIM tools that let construction firms manage big projects seamlessly. It can handle over a million building elements together with more than 20,000 tasks with the help of the platform’s intelligent scheduling system. Despite the colossal projects it can support, BEXEL Manager remains a fast-working software. With its 4D and 5D BIM tools, it can generate custom QTOs and export them in a single minute. Thus, you can save time and reduce the associated costs in every project so you can delight your clients continuously. Moreover, BEXEL Manager can integrate your BIM model with any classification system. With this, you can easily switch between tools to meet regulations and client demands in every project. BEXEL Manager is a comprehensive solution in that it integrates the critical multi-dimensional aspects of BIM technology in a single interface. With this, your firm can cut software costs and adapt your workflow to one software only. BEXEL Manager has an impressive processing power. It enables you to manage BIM models that can contain millions of elements. Despite that, the software can smoothly conduct BIM analyses in a reasonable amount of time. As a result, you can create and manage schedules with up to 20,000 tasks and identify over 15,000 clashes between model elements in a short span of time. BEXEL Manager has a flexible architecture that supports interoperability with other construction and modelling software. On top of that, it is certified by buildingSMART for IFC2x3 Coordination View 2.0. Thus, you can collaborate with team members and external partners who utilize different systems without a problem. BEXEL Manager has predefined rules and templates that make it possible to create and update specific sets of model elements and perform automatic quality control of element parameters, among others. With this, you can further optimize your processes and reduce the time spent on workflow stages. BEXEL Manager supports the management and propagation of project changes into the BIM model. At the same time, it automatically updates BIM analyses conducted within the model. As such, you can easily identify changes, like modified or added elements, and act accordingly. BEXEL Manager supports collaboration through the open BCF file format. It enables reviewers to export identified issues in a format that designers can directly import into their preferred BIM authoring tool and resolve these issues promptly. With BEXEL Manager, you can tackle projects in any market. That is because the software can integrate any classification system into BIM models. This list includes Uniformat, Masterformat, Uniclass, and DIN 276. Other than that, it can support custom classifications. BEXEL Manager enables you to oversee large projects with the help of its preconfigured construction methodologies and templates. With these, you can implement automated and streamlined processes that are interoperable and fully integrated. BEXEL Manager supports full BIM implementation throughout the entire project lifecycle. Because of this, the team can create comprehensive cloud-based databases of information and related documentation and even associate them with specific building elements. Further, the software allows the creation of facility maintenance plans and cost estimations of the FM processes. It also serves notifications regarding the implementation of FM plans, as it monitors them around the clock. Moreover, through its API capability, BEXEL Manager allows you to develop a specific procedure that will utilize any subset of BIM model information database and integrate it with other FM platforms. What Problems Will BEXEL Manager Solve? BEXEL Manager lets firms make sure that issues regarding the design are fixed before the documentation is handed to construction site managers. With this, companies can prevent reworks and delays and create better clash solutions. Moreover, the platform offers a visual understanding of the construction schedule and any opportunity for optimization. This ensures that construction remains on schedule and does not go over the budget. With BEXEL Manager, construction firms gain a new outlook on tendering quantities and descriptions. This paves the way for the visualization of elements, finer quality control, and enhanced understanding of the project documentation. Construction projects are expensive undertakings, which is why it is imperative that everyone sticks to the plan. BEXEL Manager helps firms achieve this by providing analyses of planned and actual costs. This way, key personnel can optimize and adapt to ensure the quick completion of the project while maintaining tight control over the budget. If you are interested in BEXEL Manager it may also be sensible to examine other subcategories of Best Building Information Modeling Software - BIM gathered in our base of SaaS software reviews. Each business is different, and may call for a particular type of Building Information Modeling Software - BIM solution that will be designed for their company size, type of clients and employees and even specific niche they cater to. You should not count on locating a perfect software that is going to be suitable for every company regardless of their background is. It may be a good idea to read a few BEXEL Manager reviews first and even then you should pay attention to what the service is supposed to do for your business and your staff. Do you require an easy and intuitive service with just basic features? Will you actually use the complex functionalities required by pros and large enterprises? Are there any particular features that are especially useful for the industry you work in? If you ask yourself these questions it will be much easier to find a solid service that will fit your budget. How Much Does BEXEL Manager Cost? 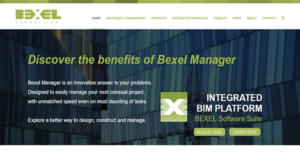 BEXEL Manager is a comprehensive BIM software from BEXEL Consulting. If you are interested in streamlining your project workflows with this solution, you can request custom enterprise pricing by phone or email. We realize that when you make a decision to buy Building Information Modeling Software - BIM it’s important not only to see how experts evaluate it in their reviews, but also to find out if the real people and companies that buy it are actually satisfied with the product. That’s why we’ve created our behavior-based Customer Satisfaction Algorithm™ that gathers customer reviews, comments and BEXEL Manager reviews across a wide range of social media sites. The data is then presented in an easy to digest form showing how many people had positive and negative experience with BEXEL Manager. With that information at hand you should be equipped to make an informed buying decision that you won’t regret. What are BEXEL Manager pricing details? What integrations are available for BEXEL Manager? BEXEL Manager can integrate with any software that supports IFC file formats. If you need more information about BEXEL Manager or you simply have a question let us know what you need and we’ll forward your request directly to the vendor.